Join Metal Mark on his culinary headbanging adventures through Tucson, AZ and beyond. Ready? Let's go! "The Sonoran Hot Dog: Tucson's tuff turf and taste war!" Alright kids...let's get this over with. OK, I have a food blog now. I live in Tucson Arizona. What do those two things combined usually mean? Yep, that's right. 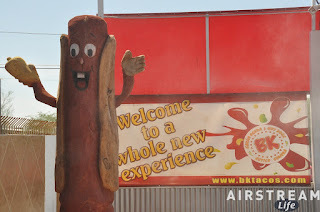 I now have to write about the infamous Sonoran Hot Dog. Tucson has the best hot dogs in the world. Oooooh! Did you hear that one? I just heard the squeals of protest from around the major continental US. Yes Chicago, your hot dogs are incredible. The poppy seed bun, the bright yellow mustard, the relish and the kosher pickle spear, the onions, the tomatoes, even the lil' chiles and dash of celery salt does indeed make yours quite the tasty contender. And you too Boston, with your “rippers”, those deep fried meaty tubes sent from Valhalla, with the bean-less chili...but you tend to put ketchup on those dogs so, well, many in the hot dog eating arena might just raise their proverbial battleaxe of tradition and wanna swipe your Bears and Bulls lovin' head right off. Oh and don't think I didn't get the jeers and quips from you too Coney Island. Where would the world be without Nathan's and your annual hot dog eating challenge? In the dark I predict. In the no Joey Chestut and mustard squiggled foot long dark. But, check this out: I've had them all. I love them all. Thing is, tradition can be taken a bit further in my humble and gastro-nerd opinion. I like eating hot dogs. I like eating Mexican food. (Strike that...I LOVE eating dogs and Mexican food). So why not combine the two? Indeed! The Sonoran dates back to the 1960s, but did not become popular until the 80s, brought over from Tucson's neighboring south of the border township of Hermosillo, which is the capital of Sonora. 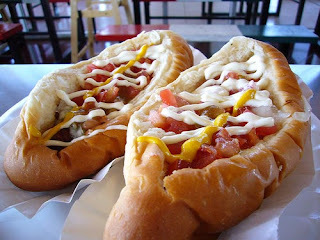 Essentially, a Sonoran Hot Dog is just a beefed up version of the American variety, but with a tangy and savory flip. When vendors came to the states to make a name and new life for themselves, they took recipes and ingredients from their native city and gave the plain' ol hot dog a kick in the cajones. A typical Sonoran Hot Dog is thus: A frank, either grilled or cooked on a griddle, sometimes its deep fried but that is very rare, is placed in a soft roll then (and this is where it gets good) is covered, no, slathered in mesquite smoked bacon, diced tomatoes and onions, yellow and cojito cheese (which is a finely grated and slightly salty Mexican cheese) tomatillo and/or red chili sauce, pinto beans, mayonnaise (you heard me), mustard and served with a fresh roasted green chili. Oh my god...you have no idea. Unless you live in Southern Arizona then, yes, you know what I'm talking about here. I'm telling you, I had no clue as to what I was in store for when I moved to Tucson from San Francisco. The Sonoran Hot Dog was my second meal here in the old pueblo, the first being a delightful brunch at a cafe called The Blue Willow but I'll discuss that place later. As my wife to be and reason for transplanting myself into a city I have only driven though (twice) from my security blanket of the California coast, where I have lived my whole life, was driving me around my new digs and getting me acquainted with Tucson, it was nearing lunch and she pulled the car into a dirt lot. The only thing that kept this particular sandlot from being totally desolate was a small food truck set up with an awning, some chairs, a table or two and a concession area. “Trust me,” is all she said. We got out of her car and walked up to the window. A sweaty Latino man stood on the other side. She-Ra then ordered four of something called “a Sonoran hot dog”. Hot dogs? Aww man. All I wanted was a sandwich or a salad bar. It was too hot and I was in no mood for a hot dog. A few minutes later our order was ready. What She-Ra handed over to me literally changed the way I felt about food and eating. In each hand was a sloppy, gloppy, mayo and pinto bean concoction nestled in a warm cozy roll over a hot dog that was barely visible from the amount of stuff it was buried under. “You're joking right?” I said. As I sat on that rickety chair, on a splintery wood table, in a town I had only recently was made aware that a major university sat at it's core, which I discovered almost a week before packing all of my belongings into a rental car and driving 14 hours to get here, as crackling Tejano music sputtered through a grease worn radio in the tiny portable kitchen, I took my first bite of a Sonoran Hot Dog. Holy crap nuts, was it good. Since then I've been on a crusade to find the ultimate Sonoran Hot Dog. Luckily for me, I live in a town that is literally split in two as to what restaurant has the best one. Some say BK. The others El Guero Canelo. Now, when I say BK, I am so not talking about Burger King...although it is funny that a successful taco stand restaurant is named such. BK started off, like many other thriving restaurants in Tucson, I was educated on, as a food truck, just like the one She-Ra took me to on my first full day in Tucson. Word spread that BK's food was so good, that folks from all over Tucson, and even neighboring cities, they would make the dry and dusty trek to get out to this brave yet humble outpost of a taco stand. Pretty soon, demand was so high that they had to actually expand into a real restaurant. Then another. There are now two locations of BK and each one is just as busy and flavorful as the other. The tacos and caramelos are amazing as is the overtly plentiful condiment area which overflows with red and green salsas, pickled onions, cucumbers, cheese and the most amazing green taco sauce I have ever tasted, like, ever (I got the recipe from the source, their salsa chef, ask me if you want it). Of course, the Sonoran hot dogs are incredible. Packed with flavor, toppling with toppings and if you don't get any on your shirt or face then you are probably eating or doing it wrong. 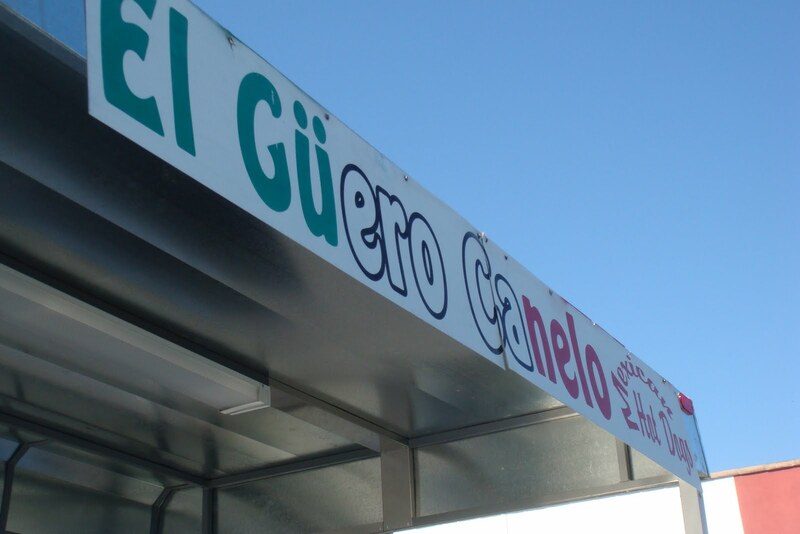 On the other hand, there's El Guero Canelo, which, just like BK, started off as a taco stand. Thing is, instead of expanding into other territories, the owners, Daniel and Bianca Contreras, decided to just build a bigger stand. Well that turned into an enclosed area which then became a spacious building like the one you see today on North Oracle road. Of course, they got so big that, yes, there is a second one on 12th Avenue. Which I have yet to visit. It's kinda far from where She-Ra and I live. The Oracle one is like right down the street. El Guero Canelo's hot dogs are a bit bigger and heartier, in my opinion, than BK's, and this is a good thing. Not as messy but still jammed up with all the traditional fixin's as BK but with a meatier approach. El Guero Canelo feels a bit more authentic, which is where the debate and loyalty come in to play. 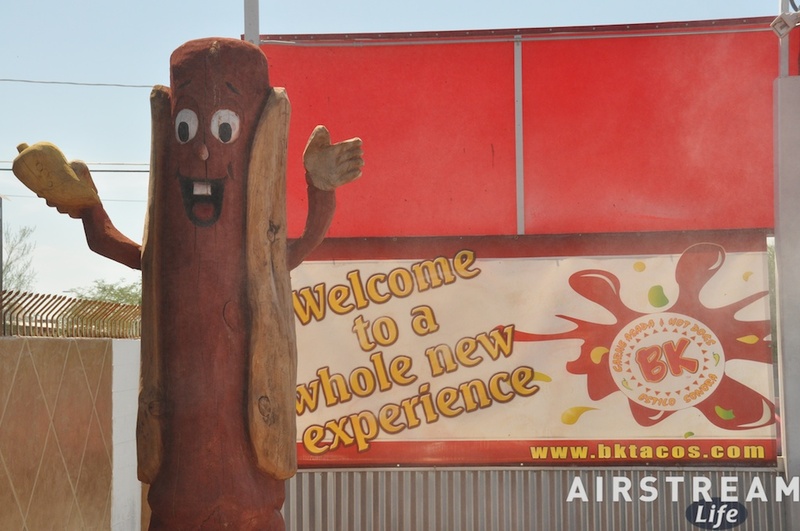 BK is more playful and robust, each hot dog is done up with rows of mayo and mustard and stocked with large green chiles. 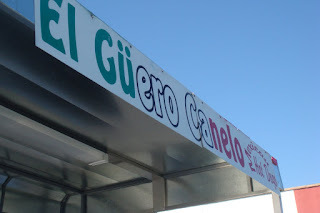 El Guero Canelo has homier and flavor-centric dynamic with theirs, not going for the bells and whistles but more along the lines of “its all in there, we just don't feel like cleaning up after you”. Both taste great. Both look good. But who is to say which Sonoran hot dog is best? Um...everyone that lives in freaking Tucson! Dude, this feud has gotten so out of hand, Food network had to step in and get their EVOO dumbed up hands and get involved. Their show, “Food Wars” stoked coals on the culinary fire to match wits with who has the best Sonoran hot dog. In the end, after much deliberation and ho-ha, the end result was BK. This didn't surprise me. I love BK, love it!, but of course they went with the pomp and circumstance and not the “well, it looks okay” but tastes amazing version from El Guero Canelo. I don't know. I still think that lil' taco stand in that dirt lot had the best hot dog. 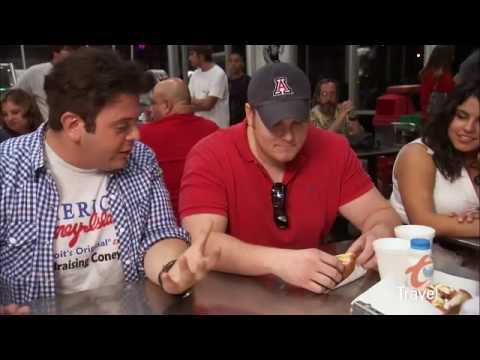 Later, Adam Richman and his Travel Chanel show “Man vs. Food” came to Tucson, not just to sample the now infamous Sonoran hot dog, but to eat the “OMFG” burger at our pal Lindy's place down on 4th Ave. That thing is six half pound patties packed sky high with cheese and Lindy's delicious secret sauce. I did the smaller version, “The Hooligan”, which is four half pound patties. I didn't eat for a month afterward. So, in the end (which is actually only the beginning) our dusty and dangerous desert metropolis has now made its mark on the world of eating. The Sonoran hot dog is a legend, in its own right and passage, but it is just an iceberg's tip of what this city has to offer as far as culinary amazement is concerned. Who would have thought? Before I moved here, I thought Tucson was just a dry sidewalk-free lawless bum patch with some never-heard-of-it university and some biker gangs. Well, it is all that and more. Hopefully the success and popularity, thanks to BK and El Guero Canelo, of the Sonoran hot dog will reach out even further to food fans far and wide. I mean, it's a frikkin bacon wrapped hot dog smothered in cheese, beans and salsa. El Guero Canelo is my winner!!!!!!!!!!!!!!!!!!!!!!!!!!!!!!! How Metal Mark conquered the dreaded Omelet! And now, may I present....Arugula! Are you ready for this? The best pizza in Tucson! 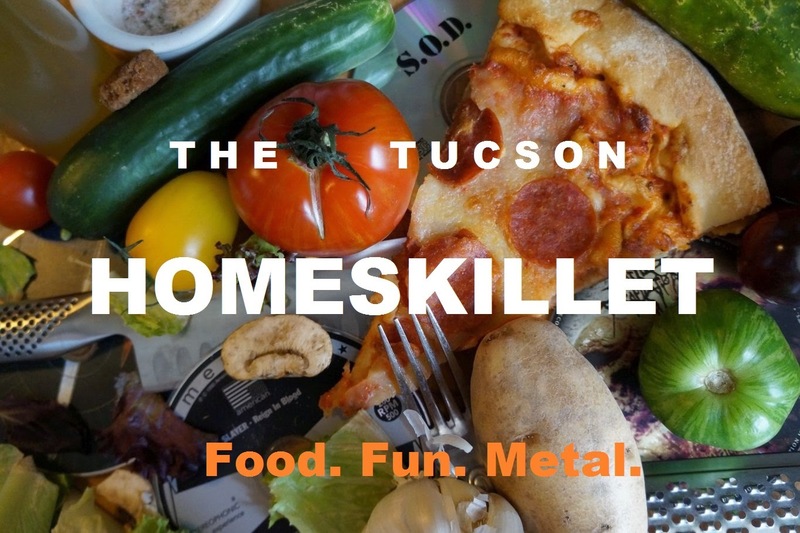 So what's the big deal about The Tucson Homeskillet?